Tatiana Achirgina-Arsiak: Our people, one of the oldest on Earth, live from Greenland to Siberia and are divided into two large branches: the Inupiq (Inuit and Iñupiat) and Yupik. Asiatic Eskimos, who live in on the coast of the Chukotka Peninsula in northeastern Siberia, belong to the Yupik group. Scientists have traced their history more than two thousand years into the past. The Asiatic Eskimos have always engaged in sea mammal hunting. Formerly they lived along the entire Chukotka coast, but by the beginning of the 20th century they had concentrated in a few villages near Bering Strait. Today, the total population is about 1,700. The Naukan people (nyvukagmit) formerly lived in the area of Cape Dezhnev and Big Diomede Island in the center of Bering Strait. Cape Chaplin and its surrounding coastline, as well as the islands in the Seniavin Strait, belonged to the Chaplino group (ungazigmit). The Sireniki people (siginygmit) occupied the coast west of Providenia Bay, concentrated in the villages of Sireniki and Imtuk. Each group spoke its own dialect and maintained its own cultural traditions. The Chaplino people became the most widespread of all Asiatic Eskimo groups. During the famines of the late 19th-beginning 20th century, many of them moved to the previously abandoned ancient settlement of Uel’kal’ and to St. Lawrence Island. In 1926, ten families from Providenia Bay moved to Wrangel Island, situated above the Arctic Circle. Their descendents are still there today. Ludmila Ainana: Our entire life comes from the sea. Eskimos settled where the water remained ice-free in winter, where walruses, whales and seals came close to the shore, and where there was a fishing stream or a bird colony nearby. Even if a place was not very convenient for humans, but rich in game, they would settle there. People at the old village of Naukan had to live on the side of a steep slope, and residents at Imtuk near Providenia Bay had to bring in drinking water from mountain springs, carrying it in leather bags. Still, they wouldn’t leave. 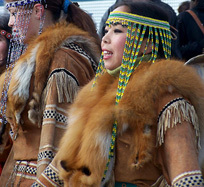 Dancers at Anadyr', Chukchi Peninsula, 2005. Photo courtesy of D'Anne Hamilton "Paaniikaaluk." That is why, for my people, the policy of closing traditional villages and resettling the residents in locations that were convenient for the Soviet authorities but not for sea mammal hunting was a real tragedy. Our traditional ties to specific places—parts of the coastline, mountains, springs—have disappeared along with the liquidated settlements. Winds, currents, ice floes, fog, storms, tides—all of this is Eskimo life, and at its heart there are sea mammals, fish, and birds. The everyday life, culture and language of the Eskimos are saturated by an understanding of their unbreakable ties with the sea. The toggling harpoon is one of the elements upon which our sea culture is based. Two other elements are inflated seal skins used as floats (pyg-pyg) and the an’yapik (Russian, baidara), a boat with a wooden frame that is held together by sinew lashings and covered with split walrus hides. These inventions, which undoubtedly date back more than two thousand years, have shaped the history of Asiatic Eskimos. Tasian Tein: Since ancient times my people held celebrations that were intricately connected to the life of sea mammal hunting. It was believed that spirits rule the sea, tundra, and sky as well as certain cliffs, mountains and capes. Wolves, brown bears, killer whales, ravens and others were considered to be sacred. The killing of one of these animals could bring severe misfortune and even death to a member of the hunter’s family. In order to placate the spirits, hunters carved small animal and human figurines that served as amulets for everyday life and celebrations. The best-known celebrations were communal. All the inhabitants of a settlement participated and guests were invited, such as Chukchi reindeer herders. One important celebration occurred when the first baidara was launched at the beginning of the spring hunting season. Sireniki villagers celebrated an Arctic fox festival that was dedicated to the successful hunting of sea and land mammals. The Naukan people had a long and elaborate whale festival, named pol’a, which was attended by guests from far away settlements. Ludmila Ainana: Celebrations were the high points of our way of life, a way of paying respect to the animals that allowed us to procure them, or as we say “came to be our guests.” We also gave respect to the hunters for their luck, bravery and skills. A hunter is always awaiting his prey. Even if he is just walking along the shore and looking at the sea, he is noticing everything. He always tries to face the sea. Hunting gives our men the greatest satisfaction—it is their real life. Eskimos don’t live in order to “produce” or “subdue nature.” They live to be what they are and to preserve their traditions, their unique worldview, and their tribal unity. Tatiana Achirgina-Arsiak: Unfortunately, during Soviet times, the hunters were reduced to the role of producing feed for Arctic foxes that were grown on fur farms. That era brought us many good things, but also sadness. The Soviet authorities scorned Eskimo traditions and took our children away to attend boarding schools. There they were taught everything but the history of their own people, their language, and the knowledge of how to live with nature. We have come upon difficult times now. We still don’t have any rights to our own land and waters, which fed our ancestors for thousands of years. Now outsiders manage our resources. “Projects of the century” are being developed behind our backs, such as off-shore oil and gas development in the Chukchi and Bering seas. The Inuit peoples of Alaska, Canada and Greenland have achieved a better situation, in which their wishes are taken into account. They are informed about all projects that are planned on their lands. Despite all the efforts of the Society of Chukotka Eskimos, Russian authorities have yet to enter into a dialogue with us. Everything is still decided without us. This article was translated by Irina Dubinina and condensed by Aron Crowell from Perekrestki kontinentov: Kul’tury korennykh narodov Dal’nego Vostoka i Aliaski [Crossroads of Continents: Cultures of the Indigenous Peoples of the Far East and Alaska]. Perekrestki kontinentovwas was edited by Valérie Chaussonnet, with Russian language editor Igor Krupnik and Russian translator P.A. Aleinikova (Arctic Studies Center, National Museum of Natural History, Smithsonian Institution, 1996).